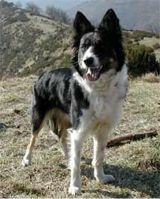 Border Collies are high energy dogs, who need an active life style. They are generally good with children and bond well with their families - but need careful handling and plenty of free running. These are primarily working dogs. Border Collies love games and are great at Frisbee, fetch/catch and softball, to name but a few. If you have trained your Border Collie inadvertently to treat other humans as livestock, he will spend the whole time herding them and he takes this job very seriously! This can be intimidating to small children and must be trained out early on - herding the cat may not be such a problem! If not kept busy and active, Border Collies can become destructive and even depressed - so think very carefully about your lifestyle before joining forces with this wonderful breed. The Border Collie takes its name from the border between Scotland and England, and was one of the first collies to win sheepdog trials. It is renowned for being able to 'hold' a sheep with a menacing stare whilst keeping perfectly still - neat trick if you can do it! It is expected to run 40 - 50 miles a day when herding sheep, a task which calls from great stamina. 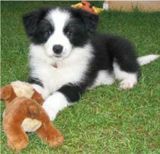 Our 4 Paw Rating - to the suitability of Border Collies for your home and lifestyle. Border Collies need to be kept busy and plenty of activity is required, not usually the first choice for a purely domestic pet. However, if properly trained, they are loving and tireless devotees. Highly energetic and active dog who loves to work, must make sure you allow for plenty of exercise at least twice every day - you are unlikely to ever tire out a Border Collie! Tremendous intelligence and desire to please, make training easy! However, if you have young children it is important to 'train out' the herding instinct !